If you think that the appearance of your smile is the only problem with missing teeth, you are unfortunately mistaken. Despite this popular belief, missing teeth can result in long-term problems for your oral health. A dental bridge is essential to help maintain a healthy mouth. 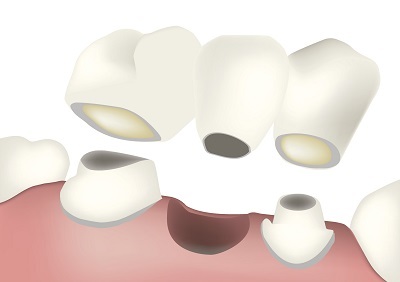 Bone loss is a common danger connected to failure to replace a missing tooth. When the natural tooth roots are no longer available to stimulate the jawbone, that bone will start to deteriorate. This could put you at risk for additional tooth loss, and it will also affect the appearance of your face. Missing teeth might also impair your ability to eat certain foods that are crucial for oral and overall health. These include crunchy fruits and vegetables that work to keep the teeth clean, stimulating saliva production and scrubbing away bacteria and food particles. When you are missing teeth, you'll be at a heightened risk of gum disease and tooth decay. Plaque and bacteria tend to accumulate in the pocket in which the former tooth used to exist. This can result in oral health problems for the surrounding teeth and gums. A missing tooth can negatively affect your self-esteem and confidence level, but a dental bridge can help. Not only will a bridge restore your smile to its former beauty, but it will also prevent your remaining teeth from shifting. Without a bridge, the other teeth may begin to shift and move into the empty space, altering your bite and the appearance of your smile. If you have missing teeth, our friendly and highly-skilled dentists can help. We use the strongest materials to construct dental bridges that will transform your smile. Call us today for a tooth replacement consultation.